It is critical to know the exact acreage and depth range of your lake to make sound management decisions. Precision GPS lake mapping conducted by The Mapping Network utilizes highly accurate procedures and equipment for data collection. Utilizing sub-foot accurate GPS units and hydro-acoustic depth-sounding equipment, our team logs data points for extremely accurate location mapping. Hydro-acoustic depth sounding equipment measures depth with unparalleled accuracy. Our clients are able to accurately understand how much water is available in their lake at any number of water levels. Best of all, this information is up-to-date and can be customized to any requirement. Need to know how many gallons of water are available when the lake is at full pool? How about if the water level is down 5, 10, or 15 feet? We can even calculate the amount of water in certain depth ranges (example: volume for 5 to 6 feet). Current, accurate results are our specialty. A GPS Bathymetric Lake Map and Volume Analysis by The Mapping Network will help optimize your efforts to manage your lake or pond. 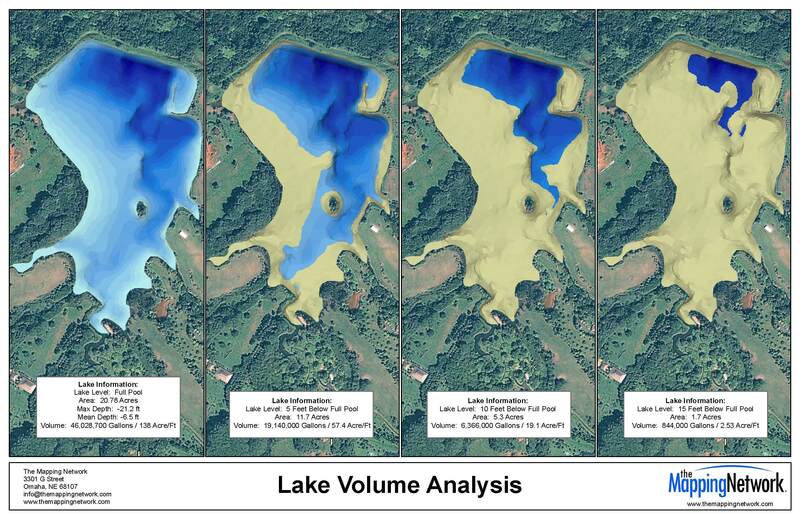 The Mapping Network offers a highly accurate "Volume Analysis" option for lakes. Need a Large Wall Map of your favorite lake, property or hunting area, or golf course? The Mapping Network provides a low cost mapping product for the outdoor enthusiast! Just let us know what area you want and we will print and ship a beautiful full-color wall map using the best aerial imagery available. This entry was posted in Lake Map and tagged California Bathymetry, California GIS Map, Dredging, Fishing, Florida Bathymetry, GPS Map, Invasive Plants Bathymetry, lake, Lake Management, Lake Map, Lake Mapping, Lake Survey, Nebraska Land For Sale, New York Bathymetry, Pennsylvania Bathymetry, Pond Medics, property or hunting area, Texas Dredging on February 28, 2011 by Moderator.